Despite political turmoil at home and abroad, the S&P 500 TR Index posted its best quarter since the end of 2013, closing up 7.7% for the quarter. The Dow Jones Industrial Average was up even more, gaining 9.6% and the tech-stock packed NASDAQ advanced 7.4% in Q3. The Dow and S&P 500 have risen now in 11 of the last 12 quarters, and the NASDAQ is on its ninth consecutive quarterly winning streak. Market volatility was also quite muted. The S&P 500 did not close up or down 1% on any day during the quarter. That is only the second time in history that milestone has been accomplished during the usually volatile third quarter (1963 was the other time). Savvy investors ignored the negatives such as global trade tensions, a bear market in Emerging Markets, slowing in Europe, and rising interest rates, as the Fed raised rates for the eight time. Instead the focus has been on the U.S. and its strong economic fundamentals. GDP grew at a very strong—though likely unsustainable—4.2% annualized pace in Q2 (reported in late July). With continued support from fiscal stimulus, Bloomberg’s consensus expectations are for solid 3% growth in Q3. Manufacturing activity remains robust, with the Institute for Supply Management’s Purchasing Manager’s Index (PMI) achieving a 14-year high in August. Consumer and business confidence are strong, with the Conference Board’s consumer confidence measure at an 18-year high and the National Federation of Independent Business’ survey the most bullish since 1974. The pace of job growth remains steady and wage growth continues to accelerate. But not all the economic news was positive. Higher interest rates have cooled the housing and auto markets and uncertainty surrounding tariffs have curbed capital investment.The U.S. market has been the place to be, lofted by fiscal and monetary stimulus, more tech stock exposure, and a strong dollar. But at some point, these tailwinds will dissipate. Given that U.S. stocks are at their highest valuations on record, trading twice as much as measured by price to net worth as international shares, it pays to remain diversified. And now we move into the month of October and year end. 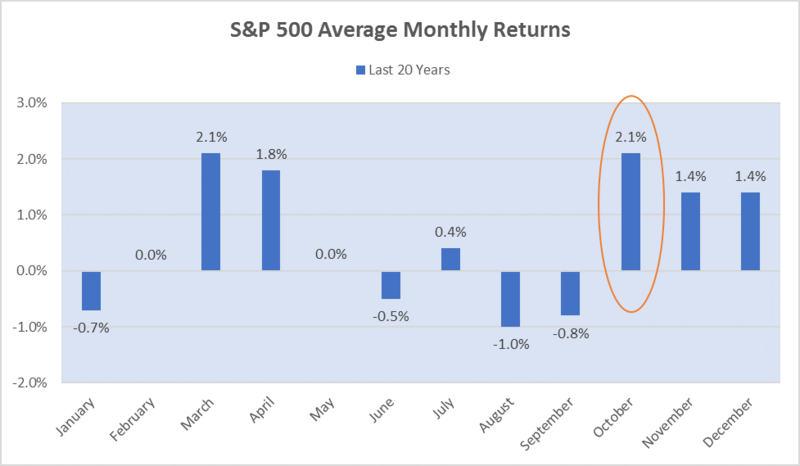 Despite being known for some big market crashes in 1929, 1987, and 2008, October is actually a historically strong month for the stock market, according to research by LPL. Traditionally the fourth quarter has also been bullish. Fixed income has also paled in comparison to equities, but against the backdrop of strong growth, rising inflation, and rising interest rates, fixed income returns have actually held up better than expected and remained flat for the quarter. And bonds remain a safe haven for investors seeking to hedge lofty equity valuations. Outside the U.S., the market picture in Q3 was definitely not as rosy. While the S&P 500 Index sits within 1% of al all-time high, European markets are flat, Chinese stocks are in a deep slump and the Japanese market, experienced a recent run-up, but still sits at the same level it stood 27 years ago. In addition to strong US economic results, corporate America delivered one of its strongest quarters of earnings growth in decades, helped by tax reform. According to FactSet, Q3 earnings growth for the S&P 500 is 19.2%, marking the highest level since Q1 2011 (19.5%). Mid-term elections on November 6th. FOMC meeting on December 19th. And then of course, there is 2019 The U.S. bull market rally has become the longest on record, avoiding a 20% or more decline. Over that time, the market has risen more than 300% since its low nine years ago on March 9, 2009. Despite the strong economic environment, at some point in the future, maybe even next year, we will experience a market pullback.